Festive tidings one and all! We can’t quite believe that Christmas day is nearly here. Book Box Club have been gearing up for the big day forever and we are so happy to think of all the Christmas trees with Book Box Club shaped gifts underneath them! Like many small businesses out there, we have had a very busy few weeks but we wouldn’t have it any other way- seeing our lovely members enjoy their boxes is the best kind of treat after all the hard work! On that note, we thought that an unboxing of our Haunted Minds November box was long overdue. We loved putting this box together. 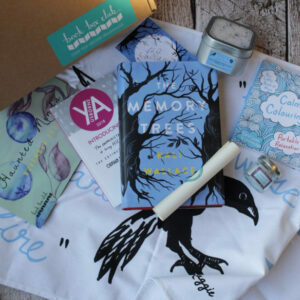 As soon as we finished the book and were battling our book hangovers, we knew that we wanted to curate a box that was the perfect relaxation antidote to all the uneasy goings-on in The Memory Trees. We are thrilled with how it all worked out and would like to thank our lovely crafty suppliers for being so professional and amazing to work with. This book is one that we have been thinking about and discussing ever since and we can’t wait to chat to all about it in our members only online book club, in fact, we already have a list of questions that we’re dying to ask Kali! The Memory Trees by Kali Wallace: Amidst a mysterious Vermont orchard the legacy of the Lovegood family has deep roots. Sorrow is the youngest in a line of haunted women, who returns to her homeland to try and uncover a lost memory. But in a place obsessed with archaic feuds and familial legends, some secrets have been masterfully buried. Scrolled Invitation to The Clubhouse Book Group: Join the friendliest online book group around! Ask Kali Wallace your questions and make new bookish buddies with our other lovely unashamedly bookish members! Raven Boys Tea Towel by Book Box Club: Whether you’re a psychic, magician or dream thief… everyone needs to do their dishes! Now chores can be completed Raven Boys style with this quotable tea towel designed exclusively by Book Box Club. The Little Book of More Calm Colouring by David Sinden & Victoria Kay: Great news: it’s now socially acceptable to love colouring and be over the age of seven! Grab your sharpies and join us in a little art therapy. 2018 New Books Preview: Read a tantalising taster of some of the awesome YA books that Usborne have planned for next year. 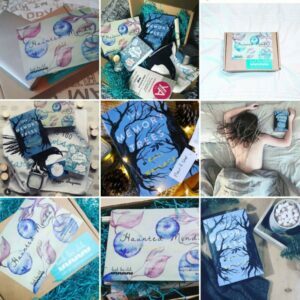 Thanks to @jlmwrites, @everypages, @getmealibrary, @geekybookdragon, @webookingloveit, @bookishbronte, @rosyclovesyreads and coffee_stars_books for these stunning snaps. Thank you to all of our lovely members who have posted about our Haunted Minds As always we have absolutely LOVED seeing all of your gorgeous unboxing photos and videos on our social media, it sounds like lots of you have been really enjoying The Memory Trees! Do keep us updated on your progress and get ready to chat about THAT ENDING at our Clubhouse meeting! While we are getting all geared up for our own Christmas break (which will no doubt mean lots of family game playing and festive feasts) we thought we would take this opportunity to wish all of you a Merry Christmas. All of our lovely club members have made our 2017 amazing and we’d like to thank all of you for your support. We are already super excited for all the plans we are making for 2018 and we just know it is going to be another brilliant year!